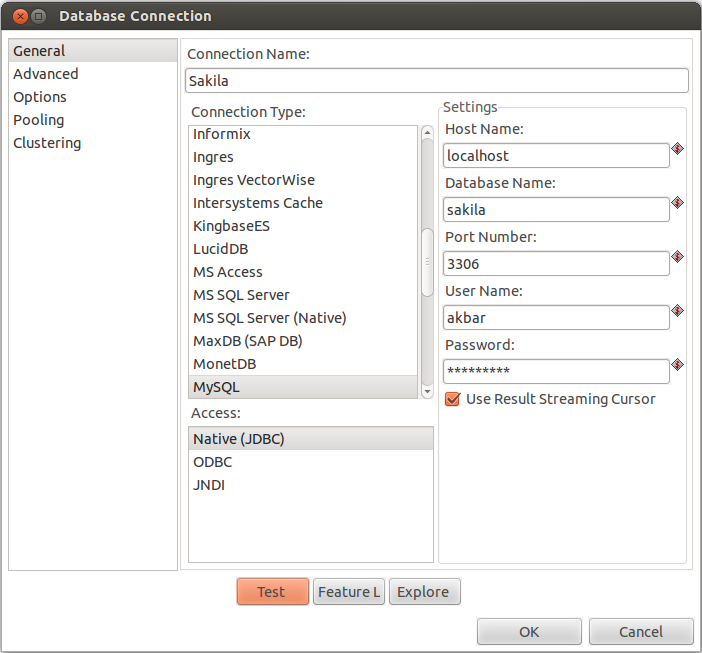 Creating a DB connection from Kettle to MySQL involves creating a MySQL use who can access the DB in question, installing the JDBC driver, and creating a connection. Download the MySQL JDBC driver from http://dev.mysql.com/downloads/connector/j/. Login to mysql.com, then click Download. In this post, I am going to create a connection to the Sakila DB. Click the New in the PDI toolbar. In Explorer in the left pane of PDI, right-click on the Sakila database connection, click Explore. You should now be able to view the tables in the Sakila database. Thanks so much for your series of entries on configuring Pentaho and Data Integration. Do you have any tips on configuring a Postgres server. The scenario I’m trying to address is enabling SSL so I can connect to a Heroku database. According to what I’ve read, I need to be able to pass the parameters through the connection but haven’t found any good documentation on how to get it done. Thanks so much for your posts on installing Pentaho. Do you have any tips on how to configure Pentaho for a Postgres connection with SSL? From what I can gather, I need to set ssl = true and sslfactory = org.postgresql.ssl.NonValidatingFactory but I’m unsure as to how to do that using Spoon. Any idea how to do that? Unfortunately, I have not written anything on Postgres + SLL with Pentaho.